Hubro is proud to present the debut recording of the exceptionally talented young piano trio Moskus. The musical roots of the group are firmly planted in the fertile earth of chamber jazz, but have been nourished by everything from hymns to the films of Ivo Caprino, from the music of Paul and Carla Bley to late-night skiing trips in the mountains, from post-rock to French pancakes and gospel. Pianist Anja Lauvdal, bass player Fredrik Luhr Dietrichson and drummer Hans Hulbækmo are all in their early twenties, and have been part of the creative milieu in the Jazz Department of the Trondheim Conservatory of Music. Anja and Hans have already made a name for themselves as part of the critically acclaimed rock bands Your Headlights are On and The Avalanche/Snøskred. In 2011 Moskus was the first jazz band to win Grappa Record Company’s annual “Debut Artist Award”. Moskus combines a personal and mature mode of expression, normally found among much older musicians, with youthful energy and unprejudiced openness. The band has a dynamic presence, alternating effortlessly between uninhibited playfulness and introspective solemnity, between free improvisation and composed material. The three members of the group function as equals, and they all contribute as composers. The album “Salmesykkel” (“Hymn Bicycle”, referring to the harmonium/reed organ/ pump organ) was recorded in January 2012 at the legendary Atlantis Grammofon Studio, one of the oldest studios in Stockholm, with technician Micke Herrström. Let’s get the linguistic problems out of the way first. This moose-related piano trio from Trondheim, Norway, whose album title translates (loosely?) as “Hymn Bicycle”, have a bright, playful style that combines a little groove with a lot of serious sentience. Pianist Anja Lauvdal comes across as a real talent, with an unshowy yet structurally alert approach, heard to great effect in the catchy opening title track. Things get chewier later on. Moskus sound like Norway’s latest young cult-status candidates. They are pianist Anja Lauvdal, bassist Fredrik Luhr Dietrichson and drummer Hans Hulbækmo, and while they recall the chamber-jazz sound of Tord Gustavsen in their casually scattered piano motifs, pulsing bass-lines and softly tramping drums, they also draw on rich idiomatic resources of their own. A remarkably mature recording, nothing sounds forced or hurried as the young trio develop their ideas at their own pace. A pleasing balance is judiciously set, too, between the relaxed feel characteristic of improv and structured compositional form, and there’s a maturity to Moskus’s rendering of the album material that belies its creators’ relative youth. Moskus is firmly in the tradition, so to speak, but satisfying nonetheless. 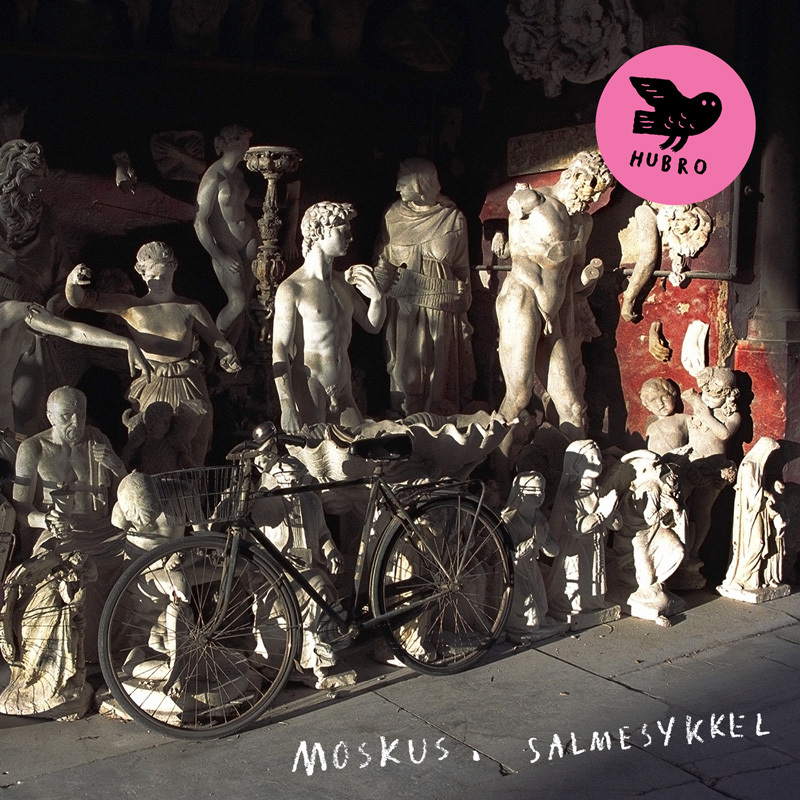 Moskus is a youthful Norwegian piano trio that specialize in quiet, fireside jazz with a colourful personality that sets their music apart from the soft jazz milieu. Over the course of ten self-written compositions, they demonstrate a maturity and softness that are actually quite refreshing in today’s blow-your-guts-out jazz universe(…) Although the trio admit to a host of influences — from Paul and Carla Bley to post-rock to French pancakes — they’ve achieved a sonic identity they can certainly call their own. That Salmesykkel is their debut is a magnificent achievement. Ocasionally introspective, sometimes outgoing but never aggressive nor humdrum, Moskus makes natural, organic music that slots into the jazz genre not least by virtue of the instruments played. It owes something to est and Tord Gustavsen but equally to Jaga Jazzists the Norwegian neo proggers, but essentially carves its own initials into the park bench that is nordic jazz. I am particularly taken with the piano playing of Lauvdal, maybe it’s because female pianists who don’t sing are so rare in this field but she seems to bring a playful effortlessness to the sound that is all to rare in this sphere. Now, here’s a fabulous way to start the day: with melodious yet creative, perfectly balanced Scandinavian jazz. Anja Lauvdal on piano, Fredrik Luhr Dietrichson on doublebass, Hans Hulbækmo on drums. Sophisticated compositions, sensibly performed. Bold combination of themes in “Salmesykkel,” melodic heights in “Nar det regne pa presten dryp det pa klokkarn,” delicate landing with “Moskus.” Recommended. Das macht Spaß. Musik ohne Scheuklappen, schwungvoll, konzentriert, humorvoll, die Jazzgeschichte verstanden habend, so präsentieren sich die drei jungen Musiker aus Norwegen, die am Trondheim Konservatorium geformt wurden. Ein Klaviertrio mit einem eigenen „Sound“. Wenn da ein molliger Paul Bley-Akkord oder eine eloquente Jarrett-Linie sich kurz auftut, dann ist da nichts Epigonenhaftes daran zu bekritteln, sondern, und dafür muss das Projekt „Moskus“ gelobt werden, zeigt nur die musikalischen Eckdaten, das Umland, den Fahrplan an. Gefahren wird dann sowieso auf einer eigenen Renn strecke. Wird interessant sein zu beobachten, wohin die Reise dieser Band geht. Wir werden wohl hoffentlich noch viel davon hören. Das hat uns ja gerade noch gefehlt – ein weiteres Pianotrio. Auch Hubro will sich nicht lumpen lassen; wenn doch alle anderen Labels Aufmerksamkeit und Geld mit dieser klassischen akustischen Jazzbesetzung verdienen, will man ja nicht außen vor bleiben. Und tatsächlich: Beim ersten Hören ist man versucht, das Debüt der gerade mal Anfang-Zwanzigjährigen als oberflächlichen, gefälligen Semi-Jazz abzutun. Doch täusche man sich nicht! Pianistin Anja Lauvdal, Kontrabassist Fredrik Luhr Dietrichson und Schlagzeuger Hans Hulbækmo aus dem Jazz-Department des renommierten Konservatoriums in Trondheim wissen sehr genau, was sie hier tun. Und machen dabei einen so selbstbewusst zurückhaltenden Eindruck, dass ihr Können, mit interpretatorischer Finesse Einflüsse aus anderen aktuellen und aus der Zeit gefallenen Musikstilen den Kammerjazz zu bereichern, schnell übersehen wird. Als Einheit erweisen sie sich auf ihrem Debütalbum als eine unschlagbare Einheit, wobei jede/r der Musiker/innen gerne mit individuellem Einfallsreichtum in Erscheinung treten darf. Dafür spricht auch, dass als Komponisten stets das Trio genannt wird. Die Jugend(lichkeit) von Moskus geht eine überzeugende Verbindung mit ihren künstlerischen Fertigkeiten ein. Mitreißend, emotional und klug. Jazz? Jo da, men Moskus beiter seg inn på andre musikalske sjangrer. Litt prog, mye folkemusikk, og dermed skaper de interessant og god musikk som fungerer veldig bra live, men også på plate. Når eg høyrer bandet Moskus på «Salmesykkel», blir eg glad i norsk jazz.